Draw out pore-clogging dirt and other impurities! Help balance, moisturize and nourish your face! Using our healthy OILS and will Dissolve, Lift, and Replace soiled oils with Hydrating and Nourishing Oils! And the Hydrosols in SPLASH will hydrate, balance your skin’s pH, and heal with amazing Plant Medicine! 1. Spray "Splash" Hydrosols onto the face & neck until moist. Rub in a bit and spray again. 2. When face & neck are still moist, massage a few drops of the "Oil" blend on top. 3. Wipe clean with soft cloth or cotton. The Splash will make the Oil creamy and penetrate deeper for a thorough cleansing & conditioning. Oil: Jojoba (Simmondsia chinensis), Evening Primrose (Oenothera biennis), Avocado (Persea americana), Carrot (Daucus carota) oils; Palmarosa (Cymbopogon martini), Clary Sage (Salvia sclarea), Lemon (Citrus limon), Sweet Orange (Citrus sinensis) and Pettigrain (Citrus aurantium) essential oils. 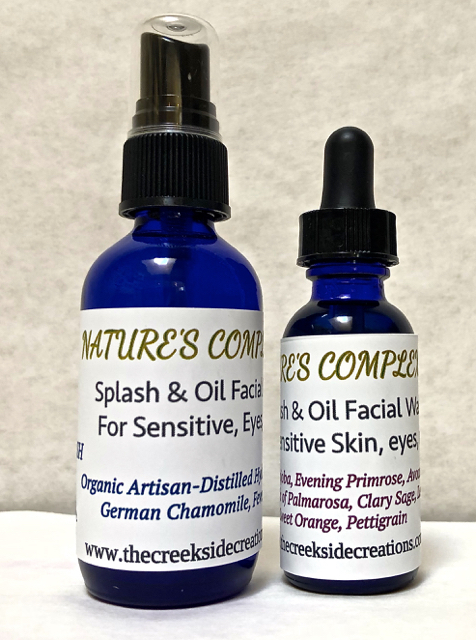 Click the button below to add the NATURE'S COMPLEXION © Splash and Oil Facial Wash: for Sensitive Skin to your wish list.